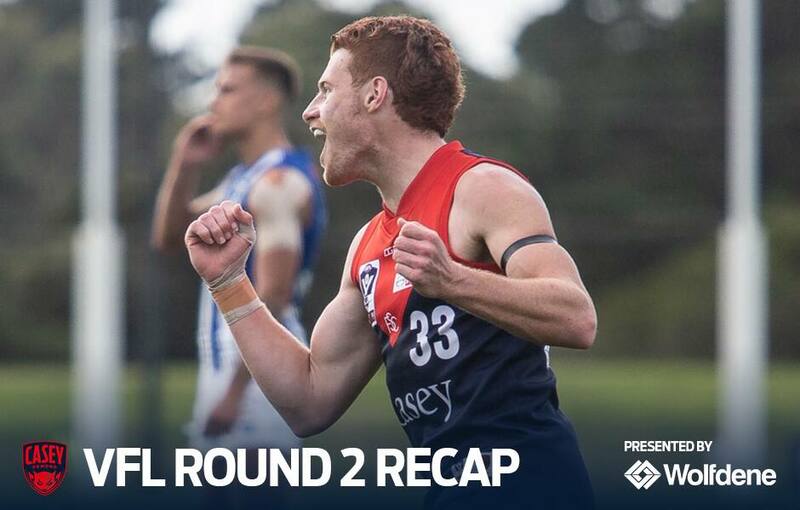 CASEY rebounded in round 2 with a resounding 54-point victory over North Melbourne on Saturday at Casey Fields. From a dominant opening quarter, the Demons looked to be back to their devastating best and have put the poor performance of Round 1 behind them. After a tepid outing in Round 1, Garlett was the best on the ground on Saturday setting the tone for the Demons and proved he is on the pathway back to his brilliant best. Finishing the game with 18 disposals, three goals, and five tackles, the 178-game AFL veteran showcased his experience having a major impact on the contest. A significant improvement from the lacklustre Round 1 effort was in the forward pressure by the small forwards. Recording over 20 tackles in the forward fifty was a testament of the pressure by players like Garlett, Kade Chandler, Toby Bedford, and Jaxon Briggs, all four didn’t stop all day. The constant duress forced North defenders into costly turnovers, while the small forwards ran rampant in front of the goals converting the mistakes into scores. FT #VFL Rd 2: @CaseyDemonsFC 18.11 119 d @NorthVFL 10.5 65. A 10 goal to 2 first half setup the win for Casey. Garlett, Briggs & White 3 goals each. The Demons defence was rock solid all game long, holding North goalless in the opening quarter, and only to two goals in the first half. Central to the dominant performance was Harrison Petty. Petty was sensational controlling the airways and repelling any of the North’s attacks, with head coach Jade Rawlings seeing Petty as one of the best players on the field in Round 2. For the second game in a row, Corey Maynard was Casey’s top disposal getter, recording 24 touches in the victory. Putting in back to back solid performances will thrust the midfielder’s name forward into the selection mix for the Melbourne side to take on St. Kilda on Saturday. Casey came through the match unscathed from injury, Declan Keilty busted his lip in the opening quarter, and Harrison Petty tweaked an ankle in the waning moments but played out the end of the match without much discomfort. “It was a significant improvement from last week … We addressed it pretty strongly through the week, we jumped out of the blocks and were able to put a gap on the scoreboard,” Jade Rawlings told Melbourne Media. Casey will have the Easter weekend off, before returning in Round 4 to take on Richmond on Saturday, April 27 at Casey Fields at 2pm. Richmond is currently sitting in fourth place on the ladder with two wins from as many games, including a 43-point drubbing of Port Melbourne. It poses a tough match-up for the home side.